• We have been told our child will need treatment in Bristol Royal Hospital for Children on a specific date. Can we pre-book a room at RMHB? Unfortunately this isn’t feasible due to the high demand for our services and the unpredictability of how long families stay with us. We find that our referral process works well and helps us to ensure that all 10 wards at the hospital receive fair treatment from us. A referral is sent by a member of the ward team from the Bristol Royal Hospital for Children once your child has been admitted. • Will we have to pay for the room? No. Our facilities are completely free of charge for families. We do ask that you pay a £20 room deposit which is refundable on leaving RMHB. Many families choose to donate their room deposit when they leave. • Our child has been admitted to the Bristol Royal Hospital for Children. How do we get a room at RMHB? If you need a room in a Ronald McDonald House Bristol, you must ask the hospital staff to refer you to us. Once your child has been admitted to hospital then the nurse or the ward clerk on the ward will complete a referral form on your behalf and send it to us. We will then allocate rooms and contact you on the ward when one is available. • When we first arrive at the RMHB reception what happens? A member of our team will welcome you to the house. We will sit together and fill out your registration form, talk about the house facilities and discuss some guidelines. We will then show you around the house so that you know where everything is and finally you will be shown to your room. • What kind of facilities are there at RMHB? We are open 365 days a year and are equipped with everything you would find in a family home. Families can get a good night’s sleep, prepare their own meals and feel at home, knowing that they’re just minutes away from their child in hospital. We have 21 bedrooms, all en-suite, and laundry facilities, kitchens, lounges, play areas and beautiful gardens. Bedding and towels can be provided by the house. Most importantly, there is a phone on the internal hospital line between you and the ward looking after your loved one, 24/7, without the distraction of a switchboard. In the kitchen we provide everything you need to cook a meal, ovens, utensils, pots, pans, knives, forks and so the list goes on, all you need to bring is the food and decide what you would like to cook. Each family are allocated their own food cupboard and there is plenty of space in our fridges and freezers. There is a communal cupboard with donated food items that you can help yourselves to at any time. The laundry comprises washing machines, dryers, irons and hangers; you just need your own washing powder. In our comfortable living room you can relax and watch television and it is also a great place for siblings with toys, games and two lovely rocking horses. Wi-Fi is available throughout the house. • How long can we stay? Families are welcome for as long as their child is in the Bristol Royal Hospital for Children. This could be days, weeks or months, and in some cases we have had families stay for almost 2 years! • Can my child’s siblings stay with us at RMHB? Yes. All we require is that children under the age of 16 must be accompanied by an adult at all times. • What happens to our room if we need to go home for a period of time but need to return? We acknowledge that you will need to go home from time to time, especially if you have been with us a while. We ask you to come to reception to inform us of your intention to go home, leave your keys with us to collect once you return. This is important for our Health & Safety and Fire Evacuation procedures. You are able to go home for 2 days without us needing to consider reallocating your room. • Do we have to clean our room ourselves? As the House is family orientated we do expected you to keep your rooms tidy throughout your stay. Cleaning buckets and a vacuum cleaner are available to help you to keep them clean. Families are also expected to clear up after themselves when using the communal areas. We will clean your room upon your departure. • Are any meals provided at RMHB? Unfortunately we do not provide meals but we have full kitchen facilities with everything you need to cook a meal, ovens, utensils, pots, pans, knives, forks and so the list goes on, all you need to bring is the food and decide what you would like to cook. Each family are allocated their own food cupboard and there is plenty of space in our fridges and freezers. There is a communal cupboard with donated food items that you can help yourselves to at any time. • Is there parking at RMHB? Unfortunately we do not have any parking facilities. You can park your car in the main car park of the hospital which offers a discounted parking cost. Please contact the Bristol Royal Hospital for Children for more information. • How far away is RMHB and how do we get there? We are a 7 minute walk from the Bristol Royal Hospital for Children. Upon exiting the hospital turn right and then walk up St Michael’s hill. We are on Royal Fort Road which is to the left opposite St Michael’s Hospital. The nurse or ward clerk can provide a map if needed and we are also easily found on Google Maps. • Is there 24/7 access to RMHB? Yes. The office is open every day of the week. There will be a display board at reception highlighting when the office will be open each day. Access after this time is by using keys and a door code. In the interests of security please do not give this code to anybody else. • Can our friends and family visit us during our stay? We encourage you to bring friends and family to RMHB so that you can feel at home. If you have available beds in your room they are also more than welcome to stay overnight. Please ensure that you have informed reception, that they are signed in on our signing in book and that no one sleeps overnight in any of the communal areas. • Can you tell me what facilities there are for disabled family members staying at RMHB? We host a number of aids to assist our guests with disabilities. Please speak to a member of the team to discuss your individual requirements. • We are not UK residents, can we stay at RMHB? Yes. No matter your nationality, if your child is being treated at the Bristol Royal Hospital for Children then you can stay with us. • Can we stay with you more than once? Yes. Each visit is treated in the same way as if it was your first time. The referral process for accommodation is the same. • What happens when the time comes for us to leave RMHB? We expect you to leave your room on the day your child is discharged. So that we can prepare the room for the next family, please inform us as early as possible. Please come and talk to us if you are experiencing any difficulties. • If it’s manageable for us are there things we can do to help RMHB during our stay? Obviously your focus will be to look after your poorly child. The house itself always needs little jobs doing such as cutting the grass, cleaning and general DIY. If you are willing to help and there is something we needed during your stay, then I am sure we can help you help us! • Can I use the facilities if I don’t have a room with you? Unfortunately not as we only have enough facilities for the families currently staying with us. If you need a room with us please ensure you ask the ward staff looking after your child to put a referral through to us and we will offer you a room as soon as one is available. • Do I have to bring items such as a travel cot, breasts pump etc. We have items available for you to use whilst you stay including: Hair dryers, towels, phone chargers, travel cots, hot water bottles, umbrellas, fans, heaters, internet cables, breast pumps, baby intercoms, blankets etc. • Do I need to bring my own radio or TV? We do not recommend that you use your own electrical appliances as we are not able to verify that they comply with our safety standards. For this reason we provide a radio and television in all bedrooms. Please be diligent at all times if you are using your own appliances. 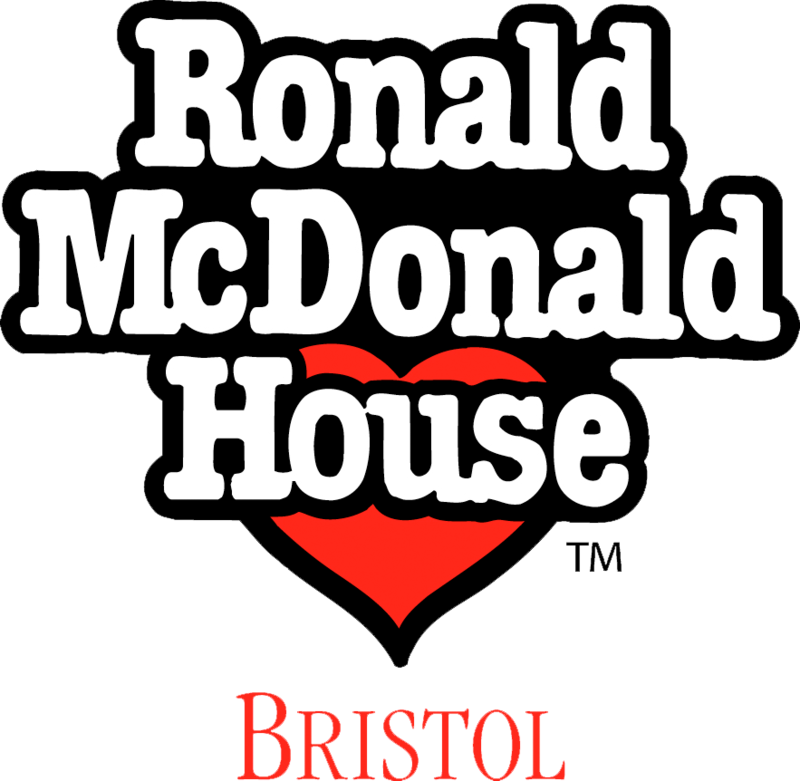 • How can I donate to Ronald McDonald House Bristol? The easiest way to donate is online by visiting our donate page. If you would like to donate by cheque please make it payable to ‘Ronald McDonald House Bristol’ and post it to Ronald McDonald House Bristol, Royal Ford Road, Bristol BS2 8DH. • Can I donate in person? We love getting visitors and would be happy to have you pop by for a catch up and hand in your donation in person. Please let us know in advance when you plan to visit the house, we will be happy to see you. • How is my donation used? We provide our accommodation absolutely free of charge and you would be helping us to do this. Every penny raised goes towards the running costs and maintenance of our home away from home so you can rest assured that your donation will be making a huge difference to the lives of families in need both now and in the future. If you would like to give to a specific project, please get in touch to hear more about our current projects. • Do I have to tell you I am fundraising? Although you are not required to let us know you are fundraising for us we would love to know and support you along the way. Please use the event registration form to register your event with us or get in touch now if you have any questions or have already concluded your fundraising. • How can I set up a fundraising page? The easiest way to do this is to go online and set up your page through Just Giving or Virgin Money Giving being sure to choose Ronald McDonald House Bristol as your cause. If you are unsure on what you would like to do or want more information on fundraising please see the planning your own event section of our website or get in touch now. • Can I use your logo in my fundraising? You certainly can. If you require our logo, please email us so we are able to attach the best version for you. • How can I request fundraising materials? You are able to request fundraising materials, such as t-shirts, flags, collection boxes and leaflets, through your event registration form. However, if you want more information or have any questions please don’t hesitate to contact our fundraising team. • Do you have resources I can use in presentations? We would be happy to help you with resources such as photographs, videos, statistics and quotes. Please contact us directly for more information. • How do I return my collection box? Once you have finished your fundraising it is important that you return your collection box for auditing purposes. You can either bring it in when you come to see us or post it back to us. Regrettably we are unable to provide pre-paid envelopes. • Am I allowed to collect money for you door-to-door or on the street? This is a very complicated activity legally speaking and you will require a licence or permit from your local authority or metropolitan police. Although we wouldn’t recommend this form of fundraising, if you wish to embark on something like this please contact our fundraising team first. • How can I keep up to date with news and events? We would love to be able to keep you up to date with all things RMHB! To receive our email newsletter please fill out this quick form. • Are you an independent charity? Yes we are an independent charity receiving no statutory, guaranteed or regular funding. This leaves us to raise all of our running costs through fundraising events and our incredible supporters. • What is your relationship with Ronald McDonald House Charities? We have an excellent working relationship with Ronald McDonald House Charities who gave us the initial funds to set up our house in 2002. Although we are completely independent and receive no funding from them now, we share many of our working practices with them in accordance with the agreement licence. To know more about our connection to RMHC, please see our history section. • What is your relationship with McDonald’s Restaurants? Whilst we receive no regular or guaranteed funding from McDonald’s restaurants or any donations from the charity boxes by the tills, they are our most prolific and enduring corporate supporter. Although they are not obliged to, many local franchised and non-franchised restaurants choose to support us with instore fundraising and donations through payroll giving. We also have a McDonald’s franchisee on our board of Trustees which greater enhances this relationship.